Jungwoon Kim is a young graduate from Kunstakademie Duesseldorf, and a bursary of the artist’s residency exchange between The Cultural centre Mogosoaia Palace and Kulturamt Duesseldorf, running from eight years by now. Jungwoon Kim is exemplary for the younger generation of artists: she is Korean by birth, German by education and global by artistic practices, while being temporarily a local host in one of the most idylic places near one of the most dystopic metropoles, Bucharest. There is nothing directly and explicitly Korean or German in her work. More than an artist in the traditional sense of the work, she is rather a producer of visual entities. They are either concrete objects or virtual, video or animated apparitions. Similarly to her contemporaries, Jungwoon Kim is not captive of an artistic genre or technique, as well as she is not captive of a definite ideology. Her objects do not feed upon an elitist science of mixing colors or carving stones. Neither they grow out of a rhetorical symbolism dependent of a political choice. Connected to a new pragmatics of the recent materials, Jungwoon Kim produces anti-fetischistic objects, simultaneously post-ideological and post-technological. They develop as ambitious ensembles, rigorous, apparently solid and proud in their abstractness derived from the currently dominating cultural codes which assimilate the ideal with the structures, and the comfort with the cleanliness. Her ensembles are manually glued together, minutely and carefully, from fragile materials, strongly contrasting with the displayed, striking pride of the neutral constructions.She employs foam for her constructions, that kind of cardboard used as support for photographs or for putting together scale models of buildings or stage props. What currently is a mock-up of a future work becomes actual work in her constructions. The cardboard turns into a fragile, vulnerable substitute of the ever-present beton, the concrete matter specific for the (supposed) solidity of the huge buldings of today. Either real, high and heavy, or imaginary, dreamy and mysterious, the buildings are clean, ghostly transparent and absolute. Moreover, after glueing them carefully, piece by piece, Jungwoon Kim unleashes waves of color unto them, like a troubling, creamy leaks with unapparent sources. The colors cheerefully smear the steps and buildings as if real passions glazing some imaginary, abstract and ideal edifices. The contrast between the ambitious, pure, but vacuous structures and their fragile materials, together with the unsettling, disturbingly colorful leaks that invade them as if some merry crimes, marks the profoundly emotional scope of the series of works shown by Jungwoon Kim in the two succesive exhibitions under the title Stair away, in Mogosoaia Palace and in Aiurart Gallery. Her objects are not only suspended, but the melancholic suspension is their subject matter. Beyond the artistic means and ideas, the crux of her work is directly affective, as they point to the irrational, to uncertainty and insecurity of rigorous and perfect edifices, founded on the rational, abstract presumption of solidity and perfection. The works, either concrete objects or videos, target the state of suspension, as their beginnings and ends are bracketed. The bracketing comprises precisely the delicate passage from certainty to uncertainty, from good and evil, from perfection and trouble, from beautiful and ugly, all of them being pertinent representations of the open and unpredictable feature of the actual existence. "Stair away by Jungwoon Kim" Art Show in Bucharest. 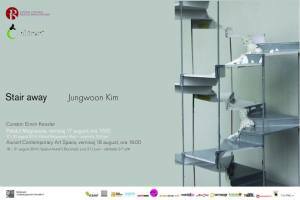 You can get here description, reviews, address, time and details of "Stair away by Jungwoon Kim" Art Show in Bucharest. Visit Bucharest Tips for more Art Show events in Bucharest!